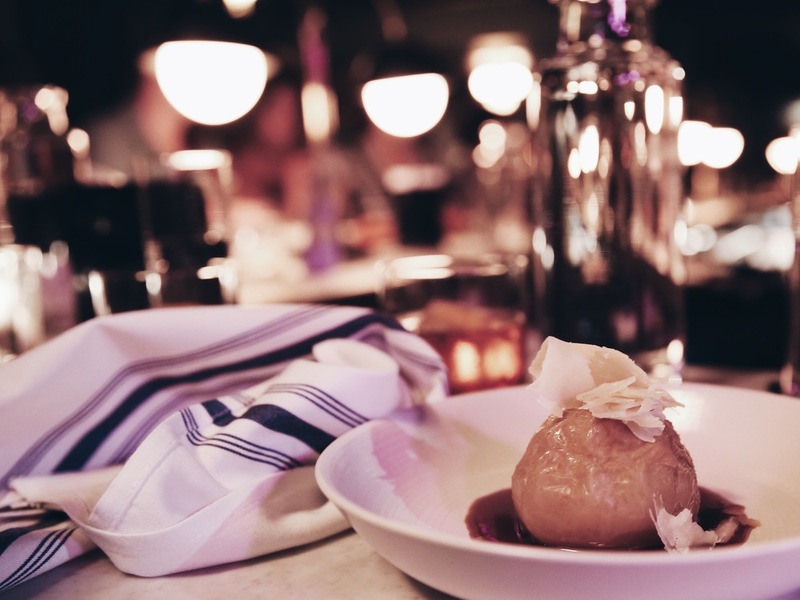 Last week I was fortunate enough to sit down with Blurb as they hosted an intimate night of dining at the Penny Royal, located at the Palladian Hotel in downtown Seattle. If you aren't familiar with Blurb, it's probably a good idea to familiarise yourself - in short, they are a platform that makes self-publishing and marketing truly accessible and attainable to everyone. There is a true sense of innovation when a platform like Blurb empowers, supports and makes progression accessible to the creative, the artists or the maker; allowing them to take their craft to the next level within their means and independently. Currently Blurb is on the road '#blurbroadshow' promoting their platform and connecting with creatives in different communities. 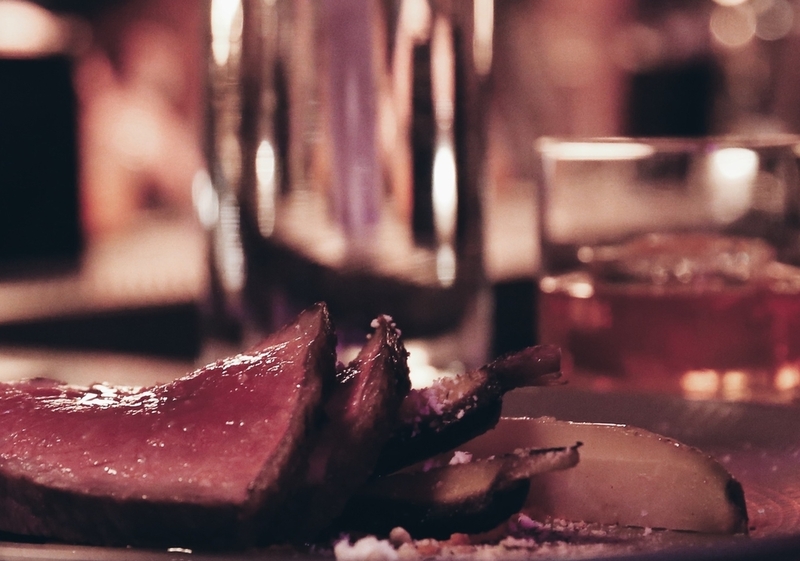 For their Seattle stop we were treated to an evening of lessons in pairings, plates + fine cocktails. 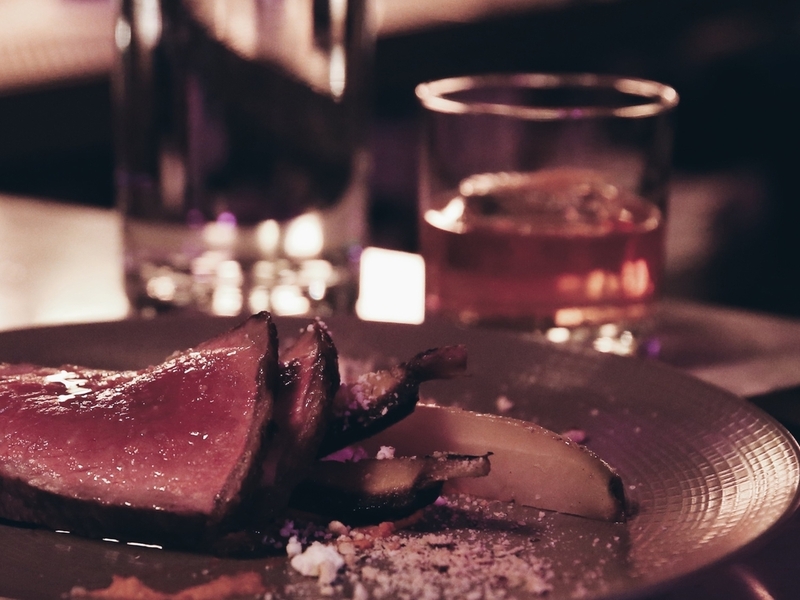 It was enlightening learning about pairings and the importance of not only balance amongst the flavors of dish and drink, but also how each can enhance the other. Such a treat then to have all our learnings followed by plate after plate (and drink after drink!) to truly experience the coming together of all these flavor pairings for ourselves. A list of our pairings can be found below and my two favorites pictured above! + paired with beef tartar, fermented chili rhubarb sauce, black garlic and a quail egg. + paired with roast foie, peach mustarda and toast. + paired with roast pork lion, grilled corn, new onion, squash blossom and goat cheese. + paired with dry aged ribeye, roast carrot, cayenne vinaigrette, feta and hazelnut. + paired with roast apple, local Beechers' cheese and molasses caramel. I think we all have moments where we feel a of lack inspiration, or some sort of 'block'. As frustrating as these moments can be I really feel they are needed, allowing us a bit of negative space to regroup and refocus. Some of the projects that I have been creatively the most proud of have stemmed from the process of coming out of such 'spaces'. Lavinia Cernau's aesthetic, how she sees her part of the world and the mood she captures in her photography, are things I look forward to daily on instagram. So, when I was stuck in one of these moments I decided to reach out to Lavinia to contribute a post on NEST. Having reached out to her for inspiration I was at first surprised to get an email from her saying that she too was feeling a lack of inspiration herself. The beautiful thing about community, connection and sharing is that we can inspire and motivate others even when we aren't feeling one hundred percent ourselves, and in the process we might find what we felt we were lacking. Lavinia also spoke about how shooting in nature and the act of baking are a couple things she finds therapeutic and does often to refocus. Below Lavinia was gracious enough to share one of these moments with us. "I must say, I don't like cooking meals as much as I like baking. For me, baking is therapeutic in some kind of magical yet simple way. It's definitely linked to my childhood, when grandma would sift her flour and mix it with water and the most whimsical thing would happen: dough. I've found this pie recipe via Tumblr and then traced it down to Eva's Adventures in Cooking website. Her amazing photos show a delicious raspberry pie but I've found you can replace or mix any fruits you may like. It's a very easy yet rewarding recipe. I strive for simplicity. I think it's in our blood, however we're the ones who make things complicated. Pie is comfort food, it's about the crunchy crust, the mix of fruits, the scent of cinnamon, the people that gather around it. Food should be about the people who share it. Go bake a pie and share it! It's so fulfilling. " Balsamic Cherry Pie with Black Pepper Crust recipe via Eva's Adventures in Cooking. First, prepare the filling. Bring the ingredients to a boil in a medium-sized saucepan over medium high heat, stirring every few minutes. Lower the heat and allow the mixture to simmer, uncovered, for 30 minutes, stirring every 5 minutes. Take care not to crush the cherries when you stir, as you want them to remain whole in the pie. At the end of the 30 minutes, the cherry filling should have thickened significantly. Remove from heat and set aside. To prepare the crust, mix together the dry ingredients in a large bowl. You have two options when adding the butter. 1) You could cut the butter into pea-sized pieces over the bowl. But this method usually means holding the butter in your hand which will warm it up, thus making less cold-induced flakiness. Or 2) You could cut the stick into general 2-inch cubes on a cutting board, add the butter cubes to the bowl and toss them to coat in the dry ingredients (this helps protect them from the warm air) and use this dough scraper to chop the butter cubes into smaller bits that are roughly pea-sized. This method is better because it keeps the butter colder longer. Begin adding the tablespoons of ice water while stirring gently. Grab a handful of the mixture and squeeze. If it generally sticks together when you let go, it is fine. If it completely crumbles apart, it needs a bit more water. Separate the dough into two pieces, one that is 2/3rds of the total dough and one that is 1/3 of the total dough. The bigger ball of dough will be the bottom crust and the smaller ball of dough will be the lattice top. Roll out the big ball of dough onto a well-floured surface, keeping it in a nice circular shape. Once it is about 1 cm thick, transfer it a lightly greased and floured springform pan that is 8 inches in diameter and 2.5 inches tall and mold into it into the sides of the pan, letting the extra crust hang off the sides. Trim excess crust, and roll out the smaller ball. Cut it into 1-inch strips for the lattice pattern, but leave the lattice pieces on a large plate lined with parchment paper. Place the plate and the crust shell, covered with plastic wrap, in the refrigerator for 30 minutes. Preheat the oven to 375 degrees Fahrenheit. For the glaze, whisk the egg and water in a small bowl until combined. Remove the pie shell and lattice from the refrigerator. Brush the tops of the lattice strips with the egg mixture. Pour the filling into the pie shell and then arrange the lattice strips on top. Use your thumbs to press the edges of the crust and lattice strips together and cut off any excess crust. After the edges of the crusts are secured, lift them up a bit so that they don't hang down over the edge too much, otherwise when the pie is done and you unhinge the cake pan, the crusts will break off when the sides of the pan expand. Brush the edges of the crust with the egg mixture as well. Place the pie in the oven and bake for 1 hour and 20 to 1 hour and 30 minutes, on the second lowest oven rack, lightly brushing the surface with more egg again at the 45 minute mark. If you notice the edges of the crust browning too quickly, cover them with tin foil. Remove from the oven and allow to cool for 45 minutes to 1 hour before serving.